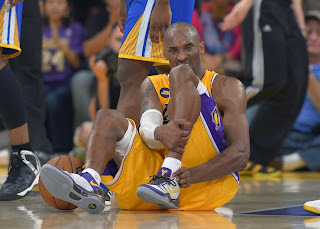 In case you missed it last night, Kobe Bryant, while leading the Los Angeles Lakers to a clutch 118-116 win over the Golden State Warriors, suffered a torn Achilles tendon that will sideline the guard for six to nine months. So what is next for not just Bryant but also the Lakers, as they fight for a playoff spot? First off, in reaction in the rush to blame Mike D'Antoni for this injury, I do understand that D'Antoni has a reputation of riding his veterans into the ground and there is no question that Bryant has been playing too much minutes, second most in the league this season, for somebody at the ripe old age of 34. However, let's be fair to the coach. First off, the team has been fighting hard for a playoff berth to avoid what would only add to an extraordinarily disappointing season. Second, since the team is poorly built as they are very top heavy, they only really play seven guys so there would be a large dropoff to whoever would be taking minutes away from Bryant, which would be big in an aforementioned tight playoff race. Third, given Bryant's competitiveness nature, we know he wants to be the leader and the man who carries his team to the playoffs, so he as D'Antoni has said before, it would take a large amount of force to get Bryant off the court. And while the wear and tear does not help, even had Bryant rested more, an injury like this could still happen. So while D'Antoni does deserve some blame, let's not throw the kitchen sink at him because we all know had the same situation happen if Phil Jackson would be the coach, all the blame would not be going his way. So what is next for Kobe? A lot of folks were knee-jerk reacting to the injury saying that he was done. After all, he is no spring chicken and this is an injury that takes a while to recover from plus it has ended careers before, including that of our good friend Charles Barkley. But those people simply do not know Bryant, who just may be the most competitive player in the league since Michael Jordan, although Jarron Collins may have something to say about that. Does anybody really think that Bryant wants to end his career like this? I would be very surprised if Bryant decided to walk away, with the only real chance I could see if the Lakers decide to get rid of him and his enormous contract, something that I would be shocked to see but considering how much of a moron Jim Buss is, can't put anything past that guy. Even as I felt that they would not make the playoffs as recently as one week ago, and even without Bryant, who has been sensational this season, I do think the Lakers will be able to hang on and hold off the Utah Jazz for the eighth spot in the Western Conference. My reasoning lies in one man: Dwight Howard. I think that now that the spotlight is solely on Howard now, which is what he wants because he is that proverbial guy, and the offense will run through him, allowing him to go off. Plus they also have a more favorable end of their schedule than does Utah, which always helps. All in all, this is a tough loss for everybody but there is just something in me that thinks that we certainly have not seen the last of Kobe Bryant.